Students stroll the red carpet heading to their first day of class. 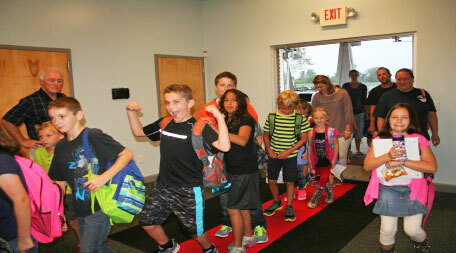 Hoots, hollers, high-fives, and “paparazzi” were awaiting the CTA elementary students as they strolled the red carpet to their classrooms on the first day back after summer break. Superintendent, Dan George, and Dean of Students, David Oldebekking, treated the students to granola bars to make sure they were well-fueled for for the full day of education and activities. Leadership is a school-wide area of focus for the 2015-2016 school year. 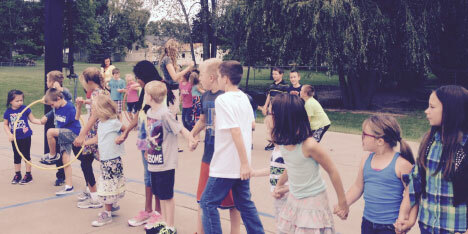 In order to emphasize this character trait, the elementary created small groups by mixing grades together with the plan to empower the older elementary students to serve as mentors to the younger students. Within the groups, the students will participate in teambuilding activities, have discussions on leaderships and the “WE ARE CHARGERS” initiative.